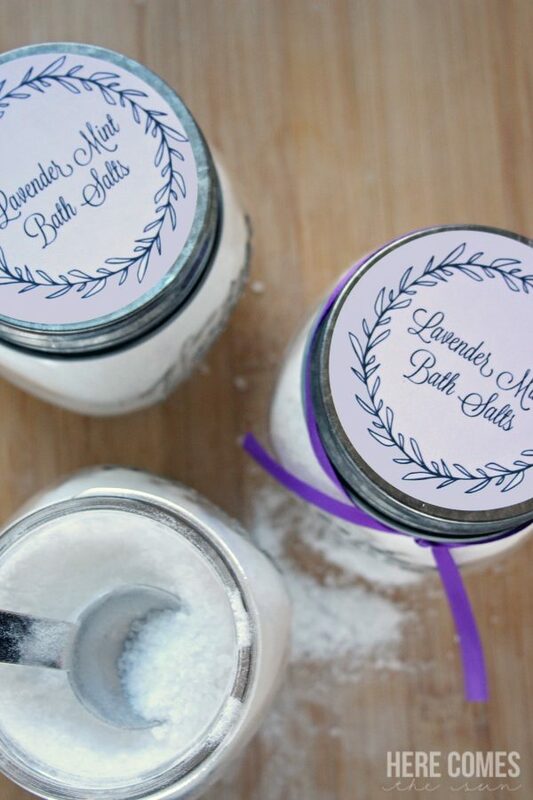 These lavender mint bath salts are inexpensive and easy to make. The perfect gift for teachers, neighbors and friends. I don’t know about you but the holidays are kinda of stressing me out this year. I said that I was going to be done with everything by Black Friday and enjoy December but unfortunately that hasn’t happened. I haven’t even gotten my Christmas cards printed yet *GASP*. It just seems like there is an unending list of things to do… decorate the tree, decorate the house, decorate the outside of the house, clean up after decorating the house, buy presents, wrap presents, attend school functions, buy presents for the kids’ gift exchanges at school, make sure the kids are wearing the appropriate things for “Christmas Spirit Week” at school, buy tickets to local holiday functions. Oh and of course make sure that your children’s holiday is the most magical ever and you capture it with THE perfect photo that has all the right lighting, composition and all that. I’m kidding about that last one. Sort of. I’m at the point where I’m in serious need of some destressing. I want to sit on the couch, stuff my face with the Christmas cookies that I haven’t made yet (mental note…need to add that to the list above) and watch Elf on continuous loop. And I need some serious pampering. 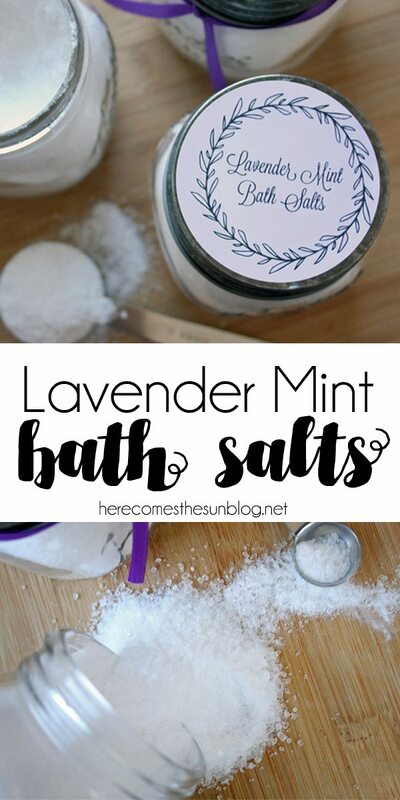 Which is why I decided to make these lavender mint bath salts. They are the perfect gift to yourself this holiday. And of course, they are perfect for teacher gifts, neighbor gifts, and last minute gift exchanges. Thanks to OnlineLabels.com for sponsoring this post. All opinions are 100% my own. 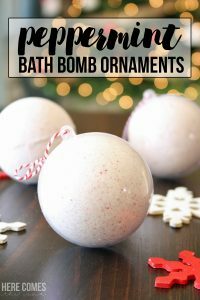 When researching how to make bath salts, I found several recipes. 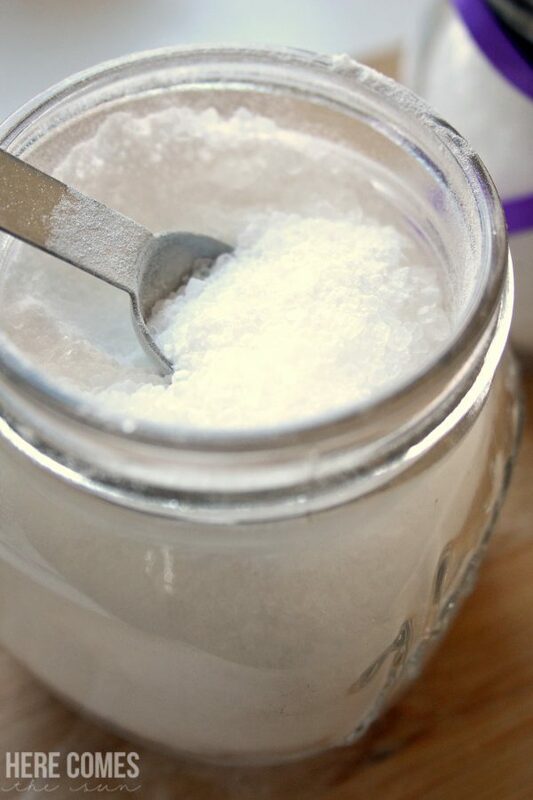 The recipe that I chose consists of 1.5 cups of Epsom salt and 1/2 cup baking soda. Mix those two ingredients together in a bowl and add 4-5 drops of lavender essential oil and 2-3 drops of peppermint essential oil. Mix together again to distribute the oils. 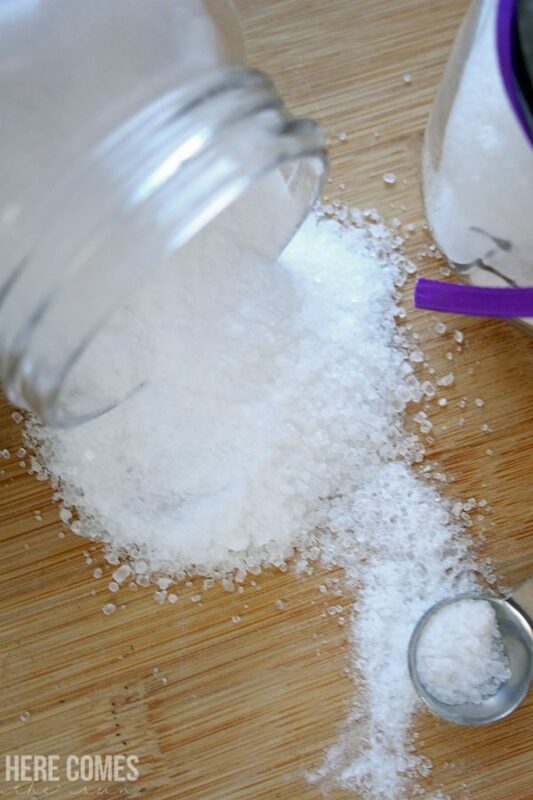 Another recipe that I found consists of a ratio of 1.5 parts epsom salt to 1 part coarse sea salt. 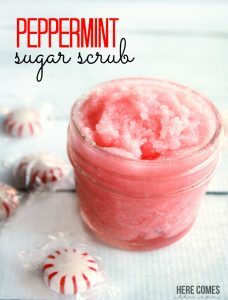 I have not tried this recipe yet but bought the sea salt and will be trying it soon. Whatever recipe you use, package it up in an airtight jar with an cute label and ribbon. The recipe fills about 1.5 of the small jars shown. I made two batches to fill three jars. And because I’m in a giving mood (it is the holidays after all), I’m giving you the printable labels for free. You know me, I’m in love with all things printable and I love designing labels and tags. I designed these labels to fit onto the OL350WX 2.5 inch circle label template from OnlineLabels.com. These labels are the perfect size and look great on top of mason jars. 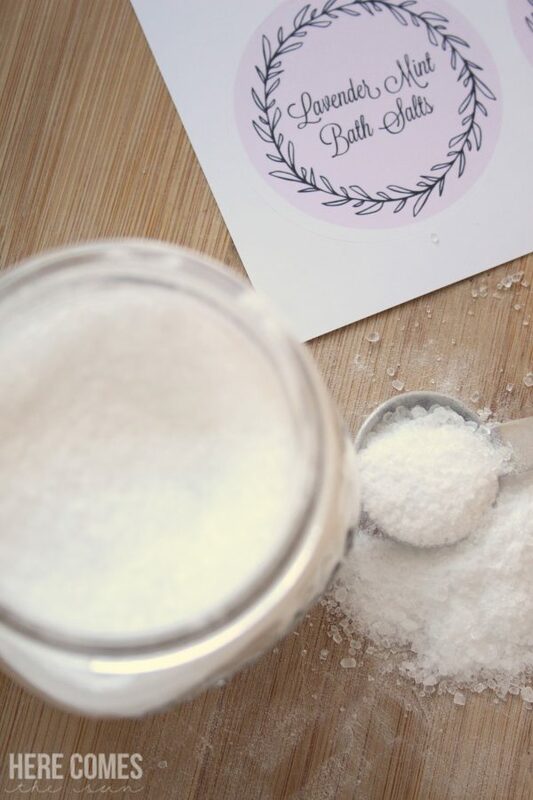 To use these labels, simply download your free bath salts labels and print them out on the OL350WX label. OnlineLabels.com also lets you design your own label right in their software. You can choose to purchase their labels and print at home or you can have OnlineLabels.com print them for you and send them to you. As always, these labels are for your personal use only. They may not be sold or redistributed. 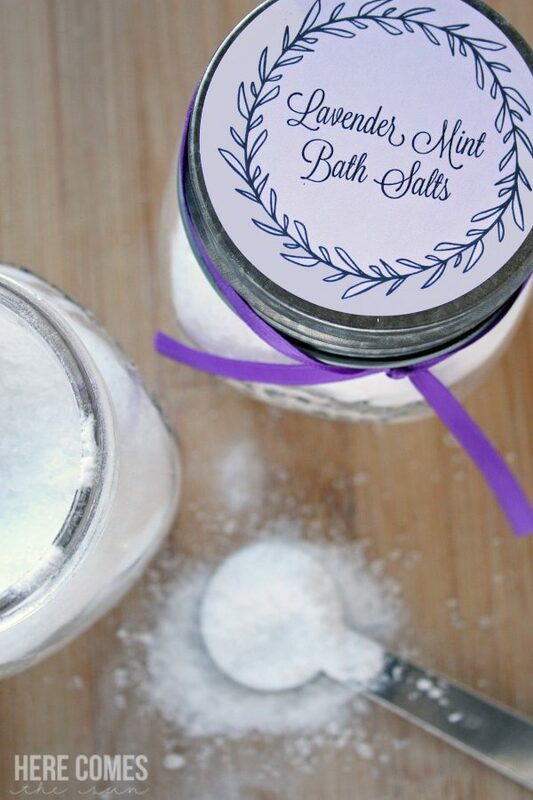 So take some time for yourself this holiday season and enjoy a nice soak in the tub with these lavender mint bath salts. 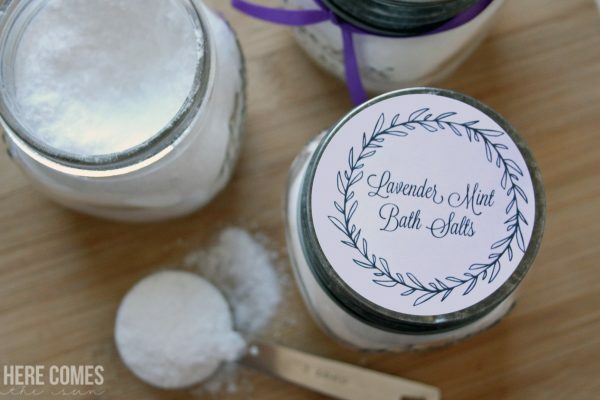 Start with 1-2 tablespoons of the bath salts and add more to your liking. And don’t forget to share the love with family and friends too. 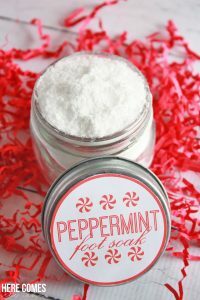 I love this bath salt idea – it must smell amazing!! I love these labels and that they have templates to fit the lids – how convenient! What an awesome gift idea and thank you for the printable! So cute!